There was a time not that long ago that I would avoid certain genres of films at all costs. One of those due to masculine code was chick flicks, but perhaps the most distanced I was with any type of offering was along the lines of horror or slasher. Sure, I enjoyed some of the classics like “Frankenstein” or “Nosferatu,” but many of the movies that tried to be in the same category released from my childhood on were less than tolerable. Yet, as I’ve learned to expand my definition of entertainment I’ve been able to discover a level of humor in them, no less defined than by this DVD. 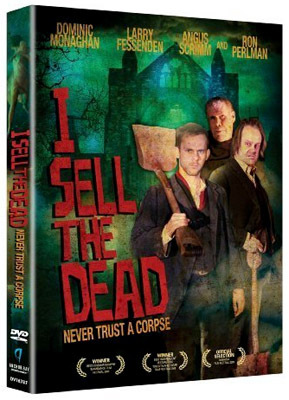 “I Sell the Dead” is not a pure comedy, but does not ever become so serious that the viewer is lost in a wave of forced story. The plot does not seem to follow one type of established horror ideal, but pieces together several popular elements like zombie, grave robbing and a touch of science fiction. The tale is set in the 18th century and follows the tale of a young man, Arthur Blake (Dominic Monaghan), who because of lack of proper job placement (that and having street begging as an alternative) steals and sells bodies for a living. He performs this gruesome task with an accomplace/mentor, Willie Grimes (Larry Fessenden), and is able to somewhat survive on the practice until he ends up on a death row of sorts. Before he loses his head over the matter, he is given a chance to confess his failings to a rather crude monk, Father Duffy (Ron Perlman). What follows is something that can certainly make one feel uneasy, but at other times requires oxygen from laughing too much. The one thing that sets this flick apart from some of the other lesser known movies Perlman has been in, he is surrounded by a cast a characters that can at least half-way match his acting talent. Things start off a bit confusing as far as what is going on, but it isn’t long before one is hooked into following the action. This is definitely something younger audiences might want to avoid due to content, but it depends on how much dark humor one can stomach. I’d certainly recommend adding this for those who enjoy this genre, I’ll be keeping an eye out for purchase as well. For a good time with plenty of B-movie cheese I bestow a spine tingling three out of five corpses. When one thinks of the classic Zombie film, the usual elements that surface include plenty of decay, screams and gore. Since comedy decided that the genre was all of a sudden one of the hottest commodities, the traditional stereotypes have been enforced, but there is a growing detachment from the usual definition. This particular offering has strong hints one might recognize from zombie lore, but leaves things open to the point that the audience may have to figure out if that is what they are watching. Of course, one thing that would have helped make this a little more clear to viewers is some kind of clue that this is several episodes of a Web television show combined into a movie-length feature. “Woke up Dead” is at times very funny and has the potential to really take off if a solid ending is ever released. Starring John Heder as lead character Drex Greene, it shows what happens when an otherwise a unremarkable human being is thrust out of his comfort zone into what is usually just stuff of Hollywood creation. 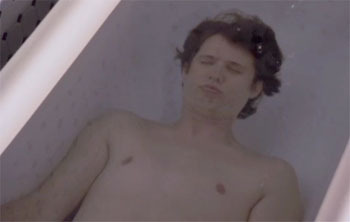 This happens when he takes a mysterious pill from a stranger and later wakes up after spending 15 minutes under water. What is otherwise a really bizarre circumstance takes on the downright freaky when his friend Matt (Josh Gad) decides to film and post a blog about it on the Internet. What follows is even stranger encounters and a friendship with someone who might help him, a medical student named Cassie (Krysten Ritter), even if she also has her own motives. There are moments that are funny, moments that make you stop and wonder, but in a way that keeps one glued waiting to see what happens next. Other than being a Zombie themed deal, there seems to be the influence of other science fiction genres from espionage to super hero exploits. I don’t know if I will watch it again, but I would not rule out watching further episodes if a second season is green-lit. If you like spoofs along the lines of “Shaun of the Dead,” you’ll probably like this too since there are a few similarities. It’s pretty tame compared to other films of the same subject matter, so other than the younger kids, it should be safe for just about any age to engage in. For what it’s worth, I’d say “Woke up Dead” earns a flesh munching two and a half out of five attacks. Past Entertainment: I am Number Four Review.